Renew Your Health: Take Advantage of Nutrition Counseling Summer Special! Would you like to revise your diet to use food as medicine to alleviate a chronic condition, to reverse many risk factors for heart disease, or to help you trim up so you can fit into your favorite swimsuit? Maybe you need a pep talk to get back on track with your diet after you ate foods on your vacation that set your health back? Or would you like to learn the tricks of the trade of how to take genetically modified foods out of what you eat? Or how to avoid gluten, grains, or sugar? Or how you can balance a few different types of therapeutic diets in the best way for you? If you answered yes to any of these questions, now is the best time to consider hiring me for personal nutrition advice to help you meet your health goals. 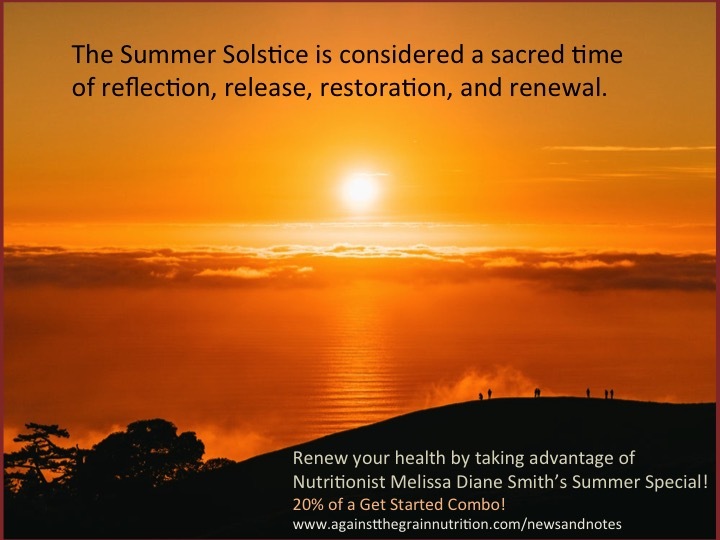 I love counseling with clients and providing them with personalized nutrition advice to improve their health and life, and the beginning of summer is considered a sacred time and often the perfect time to set new goals and get off to a fresh start. That’s why I thought now was the ideal time to launch a 20% discount ($140 instead of the normal price of $175) on my Get Started Combo (an Initial Phone Consultation and a Follow-Up for new clients) this summer. This is a limited-time only deal. Make sure to take advantage of it. The Summer Special will run through August 31, 2018.